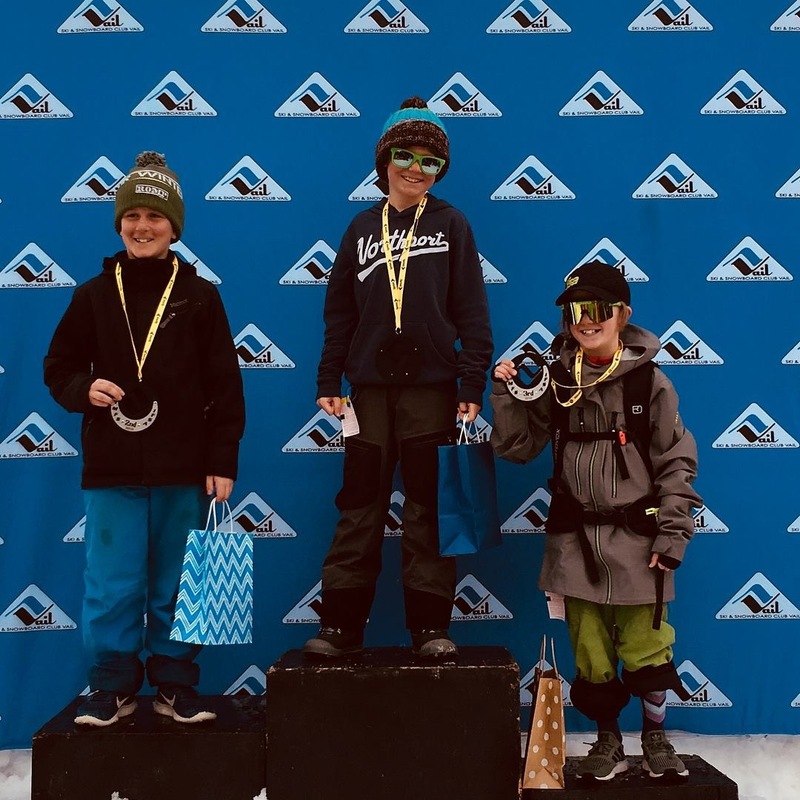 The March madness marathon wound down for local freeride athletes last weekend after events at Snowbird, Vail, and even Kappl, Austria. It was a whirlwind of a month after a weak snow year in the Rocky Mountains had events cancelled and postponed till March. But even with low snow and subpar conditions on the steeps at home, who were we kidding? These junior athletes still sent it. The Snowbird National is an annual favorite; after a slow start to the season the event was moved from its usual MLK weekend to March 16-18. In classic Little Cottonwood Canyon style, it snowed over 2 feet over the few days the CBMST was there and the athletes took full advantage of the prime conditions. 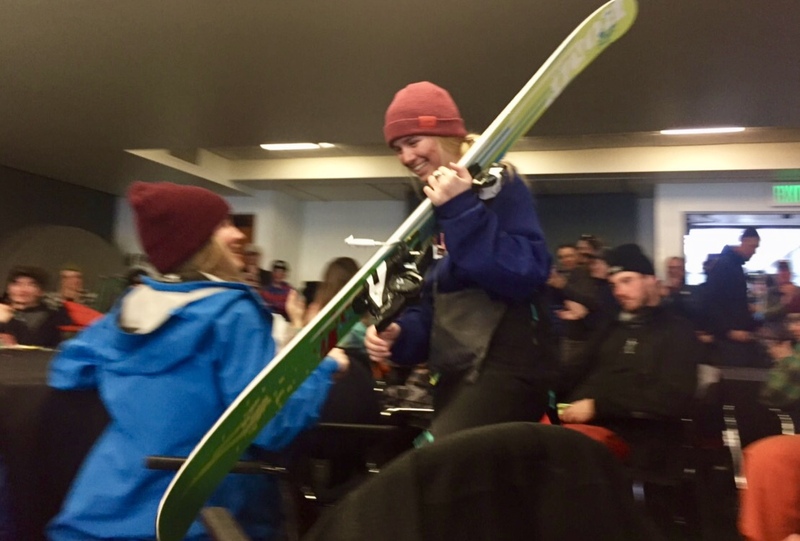 The weather also played a factor in the number of runs as only the snowboarders and 15-18 ski categories were able to get a second run during finals. Ella Haverkampf on the way up to the podium for her 1st national victory in 12-14 ski girls at Snowbird. 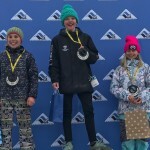 Not knowing that it was going to be the only run, Ella Haverkampf came out firing on the Silver Fox venue in 12-14 ski girls and took the win by over a point with a huge bottom air. On the boys’ side, Rowan Featherman stuck the same bottom air to put himself in 7th place on the day. The independent young gun, Tor Hudson, was able to slot himself in 8th in front of his older brother, Brooks, who had a little backslap after some really strong skiing to end in 14th. Unfortunately, Gus Bullock had one of his best comp runs to date only to send his bottom air too big and went down. 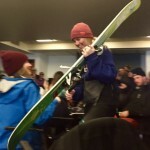 The older 15-18 athletes had to deal with a variety of visibility conditions in a snow storm after they all made finals, including: Dagan Schwartz, Avery Bernholtz, Marko Alling, Owen Berv, Kye Matlock, Holden Bradford, Dane DeFrates, Carson Hildebrandt, Turner Petersen, and Jon Clay Patterson. The move of the day on the Silver Fox venue was making your way through North Chute, the steepest part of the venue with a mandatory exit ranging in size. 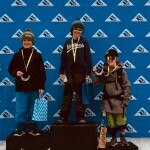 Rowen Downum and Marin Gardner in 1st and 2nd on the U12 ski boys podium at Vail. Avery Bernholtz greased her run to move up to 2nd place in ski women while Dagan Schwartz might have had the deepest run of the day, being the first to snowboard the pow through North Chute, finishing in 3rd. With some challenging visibility, Owen, Holden, and Marko stayed on their feet earning 16th, 17th, and 20th, out of 60, while unfortunately Kye Matlock and Turner getting some punch front action in the deep pow. Carson Hildebrandt maintained 4th after an impressive Day 1 run and Jon Clay Patterson layed down two top 3 runs to take 2nd behind the local Louis Overington of Altabird. 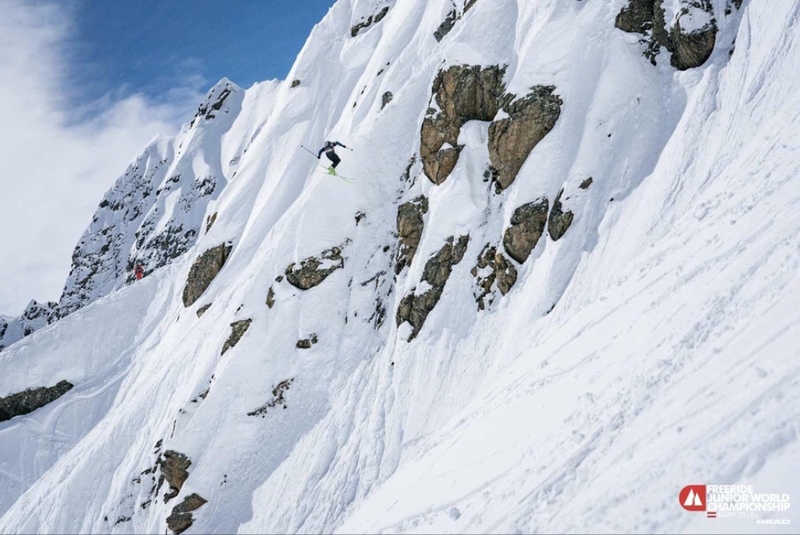 That same afternoon, Jon Clay Patterson and the CBMST Freeride Head Coach caught flights for the Freeride Junior World Championship in Kappl, Austria. The event was held on a venue used by the Freeride World Tour known as the Quellspitze, the same venue Francesca Pavillard-Cain took 2nd on in 2014. Amongst 31 of the best 15-18 male skiers in the world from 12 different countries, Jon Clay ran 3rd to last. He had a great run going capped by a massive 360 off a 30-foot cliff, unfortunately falling victim to the icy bomb hole smashed by previous competitors to finish 17th. Aiya Schwartz and Addison Featherman in 2nd and 3rd, respectively, on the U12 girls ski podium at Vail. Meanwhile, a 20-strong contingent of CBMST athletes from the comp team and U12 squad headed to Vail for the last regional of the season. The CBMST represented in force on the podium in almost all the divisions entered on the Lovers Leap venue. 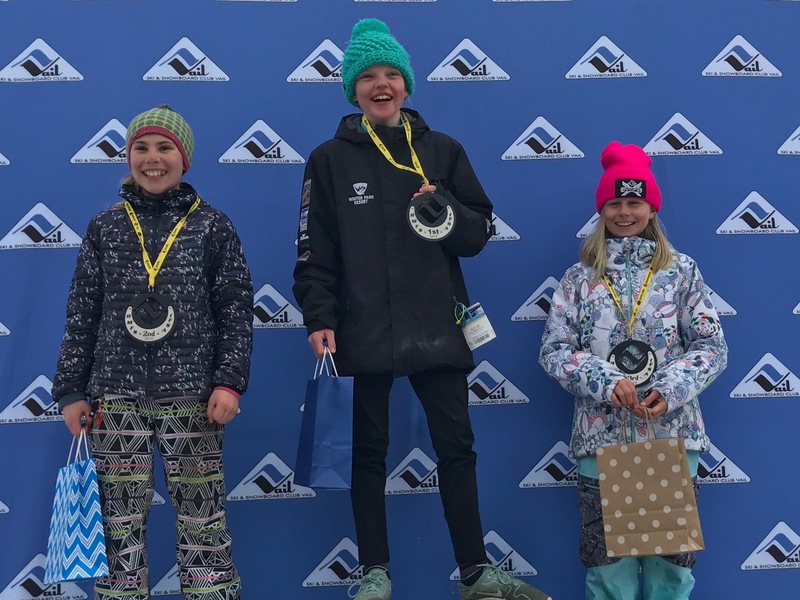 In the U12 skier girls, Aiya the Tiger Schwartz earned her 2nd second place finish on the year with Addison Featherman finishing in 3rd out of 7. Rowen Downum was on one and bested his teammate Marin Gardner by 2 points for a CBMST 1-2 punch out of 18 athletes. 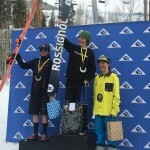 The 12-14 ski boys we led by Cooper Wight in 6th and Nate Ball, with the cast on his arm from a broken humerus suffered at Breckenridge 2 weeks prior still drying (not literally), going in 7th. Jacob Bernholtz, Nathan Sawyer, Finn Ramsey, and Rowan Featherman had various degrees of control issues putting them in 14th, 19th, 22nd, and 28th, respectively out of 29. Dagan Schwartz finished with another podium result in 2nd out of 7, while Avery Bernholtz wasn’t able to put down a strong run with 4th out of 5. To cap it off, the CBMST had 6 of the top 7 out of 23 in the 15-18 ski men with Kye Matlock in first for 2nd regional victory, Carson Hildebrandt in 2nd, Holden Bradford in 3rd, Dane DeFrates in 4th, Owen Berv in 5th, and Marko Aling in 6th. 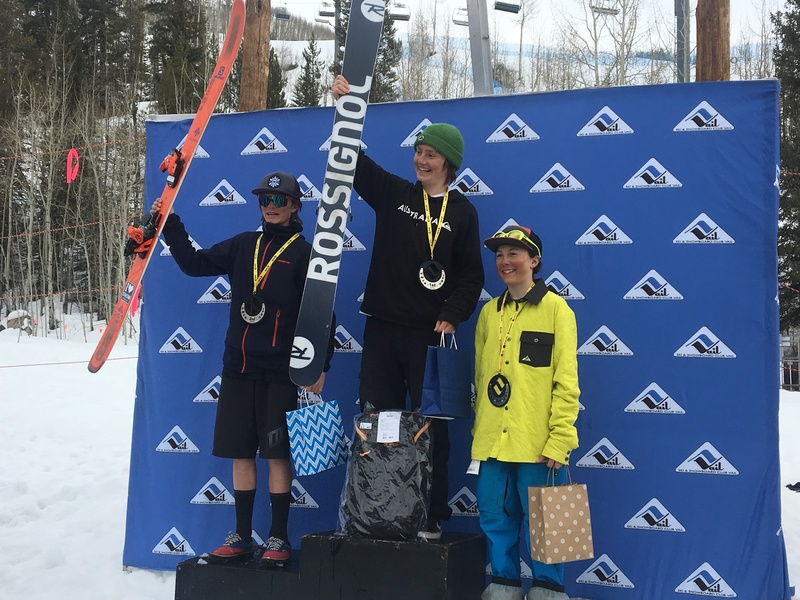 Vail 15-18 Ski Men Sweep by Kye Matlock in 1st, Carson Hildebrandt 2nd, Holden Bradford 3rd. The IFSA North American Junior Championships is the last event remaining and so far 12 athletes qualified based on their overall ranking at the end of the season. We hope to update you with good news after the event is held in Snowbird, Utah over April 10th-15th.